For other uses, see I See Fire (disambiguation). "I See Fire" is a song recorded and produced by the English singer-songwriter Ed Sheeran. It was commissioned for the soundtrack of the 2013 film The Hobbit: The Desolation of Smaug, where it was played over the closing credits. The Hobbit director, Peter Jackson, asked Sheeran to write a song for the movie after Jackson's daughter, Katie, suggested Sheeran. Sheeran saw the film, wrote the song, and recorded most of the track elements on the same day. The song was released as a digital download on 5 November 2013. Its music video was released the same day. It entered the UK Singles Chart at number 13 and reached number one in New Zealand on its sixth week, Sheeran's first number-one single there. "I See Fire" was nominated for a Satellite Award for Best Original Song. "I See Fire" plays over the first section of the closing credits of The Hobbit: The Desolation of Smaug, an epic fantasy adventure film directed by New Zealand filmmaker, Peter Jackson. Released on 13 December 2013, it is the second installment in the three-part film series based on the novel, The Hobbit, by J. R. R. Tolkien. The Hobbit follows the quest of a home-loving hobbit, a fictional, diminutive humanoid, to win a share of the treasure guarded by the dragon, Smaug. Sheeran has a lifelong devotion to the novel of Tolkien. His grandfather owns a first edition copy. It was the first book Sheeran's father read to him as a child, and the first book that he read himself. On 5 November 2013, Sheeran announced his involvement in the soundtrack in a series of online posts, which included his thanking Jackson for the opportunity. He is also a fan of Jackson's films. Jackson was introduced to Sheeran's music by his daughter, Katie, who attended Sheeran's concert in Wellington, New Zealand, in March 2013. Jackson, having learned Sheeran's regard toward his films, met him over lunch the following day where they exchanged email addresses. In late 2013, Jackson and Fran Walsh, who co-produced and co-wrote the film, were searching for an artist who would write and record the song. Following Katie's advice, they decided to tap Sheeran. Jackson sent a message to Sheeran, who was in the Mediterranean island of Ibiza attending a wedding ceremony, asking if he would be interested in the project, which Sheeran accepted. Departing from London, Sheeran and his manager, Stuart, arrived in Wellington within 48 hours. Park Road Post, a film post-production facility located in Wellington, New Zealand, where Sheeran wrote and produced "I See Fire"
Sheeran watched the film at an early screening in Park Road Post, a film post-production facility located in Wellington, New Zealand. Jackson advised Sheeran to focus on the film's ending: "Focus on the last 10 minutes. That's what the song needs to reflect[. ...] Write a song that takes the audience by the hand and leads them from Middle-earth back into reality." Capturing his reaction to watching the film, Sheeran immediately began writing the lyrics "from the perspective of being a dwarf". Jackson required a folk song and Sheeran, who is "known for songs that wouldn't fit in a Hobbit film", attempted to follow in that direction. Sheeran wrote and recorded, in only one day, most of the elements present in the released version. Further revisions were made in a course of three days that Sheeran stayed in the facility. Sheeran revealed he was given complete freedom in the creative process, while receiving ready inputs from Jackson and his co-filmmakers. In particular, Sheeran notes: "[Jackson] knows the colors and templates of what the song should be rather than how the melody should go." Sheeran also produced the song, playing all the instruments except for the cello. Despite having never played the violin, he chose to perform it himself through overdubbing. Flight of the Conchords' touring cellist Nigel Collins added cello parts as dictated by Sheeran. Pete Cobbin of Abbey Road Studios mixed "I See Fire"; Cobbin was at Park Road Post at the same time, responsible for mixing the musical score of The Desolation of Smaug. "I See Fire" is a folk ballad, characterized with gently strummed acoustic guitar. Sheeran revealed he took inspiration from the 1970s Irish folk band Planxty. According to Entertainment Weekly's Jodi Walker, the song is "touch reminiscent" of "The Parting Glass", an Irish traditional song that is a bonus track in Sheeran's debut album, +. The themes in The Hobbit are present in the song's lyrics, which refer to "fire, mountains and brotherhood". "I See Fire" was released on 5 November 2013 through iTunes, initially in the United States and then worldwide within the next 36 hours. It was later released on 10 December 2013 as part of the film's soundtrack, The Hobbit: The Desolation of Smaug, through WaterTower Music and Decca Records. Sheeran released "I See Fire" while on tour in support of his debut album; it was the first solo record that he released, two years since his last. Initially, the track was announced as a non-inclusion in his next album, subsequently titled x. However, it appeared on the deluxe edition of that album. Sheeran announced the inclusion on 9 April 2014. The official music video for "I See Fire" directed by Shane Ramirez premiered on 5 November 2013, along with the release of the song. The video shows Sheeran performing and recording the vocals, the songwriting and recording of live instruments, behind the scenes, all throughout interspersed with shots from the film. The footage which shows Sheeran performing and recording the song is shot in black-and-white, while the rest shown in full color. The video, which is uploaded in the Warner Bros. Pictures channel in YouTube, had accumulated over 80 million views as of April 2017. "I See Fire" attracted critical commentaries. In his review of the single, Nick Catucci of the Entertainment Weekly stated that although looming in the song is a "flame-broiled disaster", Sheeran "keeps his strumming cool, and a hopeful flame burning for Bilbo". For Rolling Stone, Ryan Reed wrote: "The haunting track is right in line with Sheeran's trademark style, filled with dramatic crooning and quiet acoustic guitars." Delia Paunescu of Vulture.com found "I See Fire" "so calming it may put you to sleep". In December 2013, Sheeran said he would be promoting the song until end of the awards season, in his bid to bagging a nomination at the 2014 Academy Awards (although it was not nominated). "I See Fire" was nominated for Best Original Song at the 2014 Satellite Awards. It also received nomination for Best Song Written for Visual Media from the 2015 Grammy Award. Since its release on 5 November 2013, "I See Fire" has been listed for 727 weeks in 19 different charts. Its first appearance was on 7 November in the Ireland Singles Top 100, where it debuted at number 22. The song was successful in many European countries, with a peak position of number 1 in Norway and Sweden. In Sheeran's home country, the single peaked at number 13 on the UK Singles Chart, spending 65 weeks on the chart. The British Phonographic Industry certified the single silver on 26 December 2014, denoting sales of 400,000 units. "I See Fire" was well received in Oceania. In New Zealand, single peaked at number 1 for three weeks. It was certified triple platinum by the Recorded Music NZ, denoting sales of 45,000 copies. "I See Fire" is the 6th top-selling single in New Zealand in 2014. In Australia, the single peaked at number 10 for 3 non-consecutive weeks. It has been certified two-time platinum by the Australian Recording Industry Association, denoting sales of 140,000 copies as of 2014. In Australia's 2014 year-end chart, "I See Fire" was ranked at number 78. According to commercial streaming company Spotify, "I See Fire" was the most streamed song from a soundtrack between 2013 and 2014, outperforming other popular contemporaries. In April 2015, Spotify released a report of the most streamed tracks worldwide under the category sleep. "I See Fire" was placed at number 4, joining Sheeran's other 6 songs ranked in the top 20. Sleep is one of Spotify's most popular categories "that people also use for general relaxation and to help themselves unwind". The Guardian columnist Tim Dowling suggests that the report is an indication of "very popular, slightly mellow songs that keep cropping up on sleep playlists" but not a list of a "carefully curated journey to unconsciousness". The American singer-songwriter Peter Hollens recorded a version of the song. Hollens had previously recorded "Misty Mountain" off the soundtrack for the first installment of The Hobbit series. His version of "I See Fire" features "98 different sound tracks" layered onto "8–14 vocal parts" that Hollens recorded. The Norwegian DJ and record producer Kygo released a remixed version of the song which became viral. Kygo's success is attributed largely to the reception of his remixed version of "I See Fire". Less than two years later, the remix had been played 26 million times on SoundCloud. As of May 2018, the version has been played over 62 million times on SoundCloud. The New Zealand musical trio Sole Mio released a cover version of "I See Fire" in support of New Zealand's participation at the 2015 Rugby World Cup. An Australian singer-songwriter, Joe Moore, auditioned for the fourth series of The Voice Australia with a cover version of "I See Fire". It was included as a bonus track and was released on his first studio album, A Thousand Lifetimes. The Irish musical ensemble Celtic Woman performed a cover version of the song on their album Destiny, sung by the debuting member Mairead Carlin. The German heavy metal guitarist Axel Rudi Pell has released a power ballad version of the song on his compilation album The Ballads V in 2017. ^ a b Blake, Jimmy. "Ed Sheeran: New song, I See Fire, for Hobbit sequel". BBC Online. Retrieved 5 November 2013. ^ a b c d Anderson, Kyle (6 November 2013). "Ed Sheeran on working with Peter Jackson on 'The Hobbit' song 'I See Fire': 'I'm a massive fan of Tolkien and of Peter' – Exclusive". Entertainment Weekly. Retrieved 28 August 2015. ^ a b c d Ven, Jocelyn (5 November 2013). "Ed Sheeran Is 'Geeking Out' Over His 'Hobbit: The Desolation Of Smaug' Song". MTV News. Retrieved 6 November 2013. ^ a b c Malkin, Marc (6 December 2013). "How Ed Sheeran Wrote His Hobbit Song". E! Online. Retrieved 29 August 2015. ^ a b c d e Didelot, Patricia. "Ed Sheeran Talks About 'Desolation Of Smaug' Song 'I See Fire'". The Inquisitr (3 December 2013). Retrieved 29 August 2015. ^ a b c d e f ""I See Fire" Music Video". Thehobbitblog.com. Retrieved 6 November 2013. ^ Doyle, Patric (7 April 2014). "Ed Sheeran's Heartache and Wildest Nights: Behind His Raw LP 'X'". Rolling Stone. Retrieved 2 September 2015. ^ a b c d e f Schillaci, Sophie (4 December 2013). "Ed Sheeran's 'Hobbit' Song Comes From The Dwarf Inside Him". MTV News. Retrieved 28 August 2015. ^ a b c Reed, Ryan (6 November 2013). "Ed Sheeran Releases 'Hobbit' Song 'I See Fire'". Rolling Stone. Retrieved 28 August 2015. ^ Walker, Jodi (5 November 2013). "Ed Sheeran releases original song 'I See Fire' for 'The Hobbit: The Desolation of Smaug'". Entertainment Weekly. Retrieved 2 September 2015. ^ Harris, Jamie (5 November 2013). "Ed Sheeran debuts new solo song 'I See Fire' for 'Hobbit' movie". Digital Spy (AU). Retrieved 19 February 2014. ^ "The Hobbit: The Desolation of Smaug (Original Motion Picture Soundtrack) [Special Edition]". iTunes. Retrieved 29 August 2015. ^ Kaufman, Gil (9 April 2014). "Ed Sheeran's X Tracklist Is Mystifying In All The Right Ways". MTV News. Retrieved 29 August 2015. ^ Kaufman, Gil (6 November 2013). "Watch Ed Sheeran's Studio Session With Peter Jackson In New 'Hobbit' Vid". MTV News. Retrieved 29 August 2015. ^ Catucci, Nick (15 November 2013). "Singles: November 15, 2013". Entertainment Weekly. Retrieved 2 September 2015. ^ Paunescu, Delia (7 November 2013). "Listen to 'I See Fire,' Ed Sheeran's Song for The Hobbit". Vulture.com. Retrieved 2 September 2015. ^ Schillaci, Sophie (3 December 2013). "Ed Sheeran's Next Album Already Has Taylor Swift's Stamp Of Approval". MTV News. Retrieved 29 August 2015. ^ Lindner, Emilee (23 June 2014). "Ed Sheeran's X: An Album Cheat Sheet". MTV News. Retrieved 29 August 2015. ^ "The International Press Academy Announces Nominations For The 18th Annual Satellite Awards". PR Newswire. 2 December 2013. Retrieved 29 August 2015. ^ "Ed Sheeran". Grammy.com. Retrieved 29 August 2015. ^ "Ed Sheeran – I See Fire". aCharts. Retrieved 19 February 2014. ^ "Ireland Singles Top 100 (November 7, 2013)". aCharts. Retrieved 19 February 2014. ^ a b "Norwegiancharts.com – Ed Sheeran – I See Fire". VG-lista. Retrieved 28 December 2013. ^ a b "Swedishcharts.com – Ed Sheeran – I See Fire". Singles Top 100. Retrieved 29 July 2014. ^ "Official Charts". Official Charts Company. Retrieved 29 August 2015. ^ a b "British single certifications – Ed Sheeran – I See Fire". British Phonographic Industry. Select singles in the Format field. Select Platinum in the Certification field. Type I See Fire in the "Search BPI Awards" field and then press Enter. ^ a b "Charts.nz – Ed Sheeran – I See Fire". Top 40 Singles. Retrieved 28 December 2013. ^ "Top of the pops: NZ's top selling tunes of 2014" (18 December 2014). The New Zealand Herald. Retrieved 2 September 2015. ^ a b "Australian-charts.com – Ed Sheeran – I See Fire". ARIA Top 50 Singles. Retrieved 28 December 2013. ^ "ARIA Charts – Accreditations – 2014 Singles". Australian Recording Industry Association. Retrieved 29 August 2015. ^ Brandle, Lars (7 January 2015). "Ed Sheeran, Pharrell Williams Lead Australia's 2014 End-Of-Year Charts". Billboard. Retrieved 29 August 2015. ^ McLean, Craig (16 July 2014). "Ed Sheeran interview: 'I don't make music for critics'". The Daily Telegraph. Retrieved 29 August 2015. ^ Billboard Staff (13 April 2015). "Spotify Says Ed Sheeran Dominates the World's Sleep Playlists". Billboard. Retrieved 21 August 2015. ^ Angel, Meredith (16 April 2015). "Ed Sheeran puts Spotify users to sleep the most". New York Daily News. Retrieved 21 August 2015. ^ Dowling, Tim (14 April 2015). "Spotify's top 20 songs to help you sleep: we put them to the test". The Guardian. Retrieved 21 August 2015. ^ Wete, Brad (12 December 2013). "Peter Hollens Covers Ed Sheeran's 'The Hobbit' Cut 'I See Fire' and 4 Other A Cappella Acts to Check". Billboard. Retrieved 28 August 2015. ^ "Ultra Music Festival 2015: 15 Artists You Need to See". Rolling Stone. Retrieved 29 August 2015. ^ "Myles Shear". Rolling Stone. Retrieved 29 August 2015. ^ "Ed Sheeran – I See Fire (Kygo Remix)". SoundCloud. Retrieved 29 August 2015. ^ "Amazing Rugby World Cup song – Ed Sheeran's I See Fire by SOL3 MIO". Daily Express. Retrieved 2 November 2015. ^ The Hobbit: The Desolation of Smaug – Original Motion Picture Soundtrack – Special Edition (Media notes). WaterTower Music, Decca Records. 2013. p. 6, 8. ^ "I See Fire mixed and mastered by Abbey Road Studios". Abbey Road Studios. Archived from the original on 14 February 2014. Retrieved 11 December 2013. ^ "Austriancharts.at – Ed Sheeran – I See Fire" (in German). Ö3 Austria Top 40. Retrieved 28 December 2013. ^ "Ultratop.be – Ed Sheeran – I See Fire" (in Dutch). Ultratop 50. Retrieved 28 December 2013. ^ "Ultratop.be – Ed Sheeran – I See Fire" (in French). Ultratop 50. Retrieved 28 December 2013. ^ "Ed Sheeran Chart History (Canadian Hot 100)". Billboard. Retrieved 28 December 2013. ^ "ČNS IFPI" (in Czech). Hitparáda – Radio Top 100 Oficiální. IFPI Czech Republic. Note: Change the chart to CZ – RADIO – TOP 100 and insert 201501 into search. Retrieved 15 January 2017. ^ "ČNS IFPI" (in Czech). Hitparáda – Digital Top 100 Oficiální. IFPI Czech Republic. Note: Change the chart to CZ – SINGLES DIGITAL – TOP 100 and insert 201433 into search. Retrieved 19 August 2014. ^ "Danishcharts.com – Ed Sheeran – I See Fire". Tracklisten. Retrieved 28 December 2013. ^ "Euro Digital Songs". Billboard. Retrieved 15 January 2017. ^ "Ed Sheeran: I See Fire" (in Finnish). Musiikkituottajat – IFPI Finland. Retrieved 13 January 2014. ^ "Lescharts.com – Ed Sheeran – I See Fire" (in French). Les classement single. Retrieved 28 December 2013. ^ "Offiziellecharts.de – Ed Sheeran – I See Fire". GfK Entertainment Charts. Retrieved 15 January 2017. ^ "Archívum – Slágerlisták – MAHASZ" (in Hungarian). Single (track) Top 40 lista. Magyar Hanglemezkiadók Szövetsége. Retrieved 28 December 2013. ^ "Archívum – Slágerlisták – MAHASZ" (in Hungarian). Stream Top 40 slágerlista. Magyar Hanglemezkiadók Szövetsége. Retrieved 15 January 2017. ^ "Ed Sheeran This Chart History". RÚV. Retrieved 24 May 2017. ^ "Chart Track: Week 46, 2013". Irish Singles Chart. Retrieved 28 December 2013. ^ "Luxembourg Digital Songs". Billboard. Retrieved 15 January 2017. ^ "Nederlandse Top 40 – week 13, 2014" (in Dutch). Dutch Top 40 Retrieved 15 January 2017. ^ "Dutchcharts.nl – Ed Sheeran – I See Fire" (in Dutch). Single Top 100. Retrieved 28 December 2013. ^ "Listy bestsellerów, wyróżnienia :: Związek Producentów Audio-Video". Polish Airplay Top 100. Retrieved 6 May 2014. ^ "Media Forest – Weekly Charts. Media Forest. 12 May 2014. Retrieved 2 July 2018. Note: Romanian and international positions are rendered together by the number of plays before resulting an overall chart. ^ "Official Scottish Singles Sales Chart Top 100". Official Charts Company. Retrieved 28 December 2013. ^ "ČNS IFPI" (in Slovak). Hitparáda – Radio Top 100 Oficiálna. IFPI Czech Republic. Note: insert 201415 into search. Retrieved 28 December 2013. ^ "ČNS IFPI" (in Slovak). Hitparáda – Singles Digital Top 100 Oficiálna. IFPI Czech Republic. Note: Select SINGLES DIGITAL - TOP 100 and insert 201501 into search. Retrieved 15 January 2017. ^ "Spanishcharts.com – Ed Sheeran – I See Fire" Canciones Top 50. Retrieved 29 July 2014. ^ "Swisscharts.com – Ed Sheeran – I See Fire". Swiss Singles Chart. Retrieved 28 December 2013. ^ "Ed Sheeran: Artist Chart History". Official Charts Company. Retrieved 15 January 2017. ^ "Ed Sheeran Chart History (Bubbling Under Hot 100)". Billboard. Retrieved 15 January 2017. ^ "Ed Sheeran Chart History (Digital Songs)". Billboard. Retrieved 15 January 2017. ^ "Ed Sheeran Chart History (Hot Rock Songs)". Billboard. Retrieved 15 January 2017. ^ "Jaarlijsten 2013" (in Dutch). Stichting Nederlandse Top 40. Retrieved 15 January 2017. ^ "Top Selling Singles of 2013". Recorded Music NZ. Retrieved 1 January 2015. ^ "ARIA Top 100 Singles 2014". Australian Recording Industry Association. Retrieved 7 January 2015. ^ "Jahreshitparade 2015" (in German). Hung Medien. Archived from the original on 4 January 2016. Retrieved 15 January 2017. ^ "Jaaroverzichten 2014" (in Dutch). Ultratop & Hung Medien. Retrieved 15 January 2017. ^ "Track Top-50 2014". Hitlisten.NU. Archived from the original on 8 January 2015. ^ "Top 100 Single-Jahrescharts". GfK Entertainment (in German). offiziellecharts.de. Retrieved 10 August 2015. ^ "MAHASZ Single (track) TOP 100 – chart-pozíció alapján – 2014" (in Hungarian). Association of Hungarian Record Companies. Retrieved 15 January 2017. ^ "Jaarlijsten 2014" (in Dutch). Stichting Nederlandse Top 40. Retrieved 15 January 2017. ^ "Jaaroverzichten – Single 2014". Hung Medien. Retrieved 15 January 2017. ^ "Top Selling Singles of 2014". Recorded Music NZ. Retrieved 27 December 2014. ^ "Utwory, których słuchaliśmy w radiu – Airplay 2014" (in Polish). Polish Society of the Phonographic Industry. Retrieved 21 January 2015. ^ "Årslista Singlar – År 2014" (in Swedish). Sverigetopplistan. Swedish Recording Industry Association. Retrieved 8 December 2016. ^ "Swiss Year-end Charts 2014". Hung Medien. Archived from the original on 1 January 2015. Retrieved 15 January 2017. ^ "End of Year Singles Chart Top 100 – 2014". Retrieved 15 January 2017. ^ "Hot Rock Songs: Year End 2014". Billboard. Retrieved 21 December 2014. ^ "Track Top-100, 2015". Hitlisten.NU. Archived from the original on 26 January 2016. Retrieved 15 January 2017. ^ "Jaaroverzichten – Single 2015". Hung Medien. Retrieved 15 January 2017. ^ "Årslista Singlar – År 2015" (in Swedish). Sverigetopplistan. Swedish Recording Industry Association. Retrieved 8 December 2016. ^ "ARIA Charts – Accreditations – 2014 Singles". Australian Recording Industry Association. Retrieved 4 October 2015. ^ "Austrian single certifications – Ed Sheeran – I See Fire" (in German). IFPI Austria. Retrieved 4 October 2015. Enter Ed Sheeran in the field Interpret. Enter I See Fire in the field Titel. Select single in the field Format. Click Suchen. ^ "Ultratop − Goud en Platina – singles 2016". Ultratop. Hung Medien. Retrieved 19 March 2016. ^ "Canadian single certifications – Ed Sheeran – I See Fire". Music Canada. Retrieved 27 September 2017. ^ "Certificeringer – Ed Sheeran – I See Fire" (in Danish). IFPI Denmark. Retrieved 1 June 2014. ^ "Italian single certifications – Ed Sheeran – I See Fire" (in Italian). Federazione Industria Musicale Italiana. Retrieved 4 October 2015. Select "2014" in the "Anno" drop-down menu. Select "I See Fire" in the "Filtra" field. Select "Singoli online" under "Sezione". 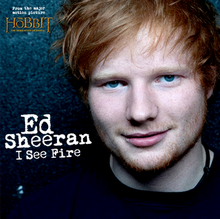 ^ "New Zealand single certifications – Ed Sheeran – I See Fire". Recorded Music NZ. Retrieved 4 October 2015. ^ "Ed Sheeran – I See Fire" (in Swedish). Grammofon Leverantörernas Förening. Retrieved 23 October 2014. ^ "Certificeringer – Ed Sheeran – I See Fire" (in Danish). IFPI Denmark. Retrieved 9 October 2014. Australia: "The Hobbit: The Desolation of Smaug (Original Motion Picture Soundtrack) [Special Edition] by Howard Shore". iTunes Store (Australia). Apple. Retrieved 6 November 2013. Austria: "The Hobbit: The Desolation of Smaug (Original Motion Picture Soundtrack) [Special Edition] von Howard Shore" (in German). iTunes Store (Austria). Apple. Retrieved 6 November 2013. Belgium: "The Hobbit: The Desolation of Smaug (Original Motion Picture Soundtrack) [Special Edition] by Howard Shore". iTunes Store (Belgium). Apple. Retrieved 6 November 2013. Canada: "The Hobbit: The Desolation of Smaug (Original Motion Picture Soundtrack) [Special Edition] by Howard Shore". iTunes Store (Canada). Apple. Archived from the original on 18 June 2014. Retrieved 6 November 2013. Denmark: "The Hobbit: The Desolation of Smaug (Original Motion Picture Soundtrack) [Special Edition] by Howard Shore". iTunes Store (Denmark). Apple. Retrieved 6 November 2013. Finland: "The Hobbit: The Desolation of Smaug (Original Motion Picture Soundtrack) [Special Edition] by Howard Shore". iTunes Store (Finland). Apple. Retrieved 6 November 2013. France: "The Hobbit: The Desolation of Smaug (Original Motion Picture Soundtrack) [Special Edition] par Howard Shore" (in French). iTunes Store (France). Apple. Retrieved 6 November 2013. Germany: "The Hobbit: The Desolation of Smaug (Original Motion Picture Soundtrack) [Special Edition] von Howard Shore" (in German). iTunes Store (Germany). Apple. Retrieved 6 November 2013. Ireland: "The Hobbit: The Desolation of Smaug (Original Motion Picture Soundtrack) [Special Edition] by Howard Shore". iTunes Store (Ireland). Apple. Retrieved 6 November 2013. Italy: "The Hobbit: The Desolation of Smaug (Original Motion Picture Soundtrack) [Special Edition] di Howard Shore" (in Italian). iTunes Store (Italy). Apple. Retrieved 6 November 2013. Mexico: "The Hobbit: The Desolation of Smaug (Original Motion Picture Soundtrack) [Special Edition] de Howard Shore" (in Spanish). iTunes Store (Mexico). Apple. Archived from the original on 18 June 2014. Retrieved 6 November 2013. Netherlands: "The Hobbit: The Desolation of Smaug (Original Motion Picture Soundtrack) [Special Edition] van Howard Shore" (in Dutch). iTunes Store (Netherlands). Apple. Retrieved 6 November 2013. New Zealand: "The Hobbit: The Desolation of Smaug (Original Motion Picture Soundtrack) [Special Edition] by Howard Shore". iTunes Store (New Zealand). Apple. Retrieved 6 November 2013. Norway: "The Hobbit: The Desolation of Smaug (Original Motion Picture Soundtrack) [Special Edition] by Howard Shore". iTunes Store (Norway). Apple. Retrieved 6 November 2013. Portugal: "The Hobbit: The Desolation of Smaug (Original Motion Picture Soundtrack) [Special Edition] by Howard Shore". iTunes Store (Portugal). Apple. Retrieved 6 November 2013. Spain: "The Hobbit: The Desolation of Smaug (Original Motion Picture Soundtrack) [Special Edition] de Howard Shore" (in Spanish). iTunes Store (Spain). Apple. Retrieved 6 November 2013. Sweden: "The Hobbit: The Desolation of Smaug (Original Motion Picture Soundtrack) [Special Edition] av Howard Shore" (in Swedish). iTunes Store (Sweden). Apple. Retrieved 6 November 2013. Switzerland: "The Hobbit: The Desolation of Smaug (Original Motion Picture Soundtrack) [Special Edition] von Howard Shore" (in German). iTunes Store (Switzerland). Apple. Retrieved 6 November 2013. United Kingdom: "The Hobbit: The Desolation of Smaug (Original Motion Picture Soundtrack) [Special Edition] by Howard Shore". iTunes Store (United Kingdom). Apple. Retrieved 6 November 2013. United States: "The Hobbit: The Desolation of Smaug (Original Motion Picture Soundtrack) [Special Edition] by Howard Shore". iTunes Store (United States). Apple. Retrieved 6 November 2013. "Hearts Don't Break Around Here"
"How Would You Feel (Paean)"
This page was last edited on 12 April 2019, at 19:16 (UTC).